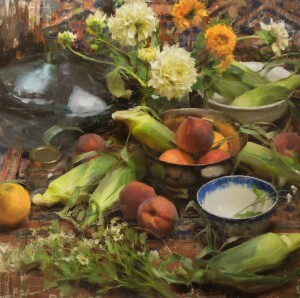 Each day, Daniel will do a demonstration while discussing the skills necessary for creating beautiful still life paintings using “Alla Prima” methods. Following each mornings’ demo, students will set up still life compositions of their own and paint them from life while receiving one-on-one instruction. During this intensive course, students will receive insight into learning to see correctly and develop an adeptness in the following areas: composition, drawing, color, value and edges.